Details at the end of this post on how to enter to win a copy of Class Reunions are Murder, and a link to purchase it from Amazon and an indie bookstore where a portion goes to help support KRL. Six months after the death of her husband, Poppy McAllister Browne is still consoling herself with late night infomercial shopping, Pop-Tarts, and cookie dough. Feeling like she was fat, frumpy, and a failure, attending her twenty-fifth high school is about the last thing Poppy would ever want to do. She escaped her South Jersey hometown with the goal of never returning, and only her best friend Sawyer Montgomery’s plea for support could lure Poppy back. The Mean Girls of the 80s are still just as vicious, and while a confrontation at the reunion leaves Poppy momentarily victorious, it also has the result in her getting arrested when Barbie Pomeroy Clark is found dead. Although nearly everyone seemed to still hate Barbie, her Legally Blond friend Amber Fenton is now a police officer intent on seeing Poppy convicted. With her own group of loyal friends by her side and spurred on by an unlikely group of incarcerated hookers, Poppy will have to face down her fears and defeat the insecurities that have plagued her most of her life. Leading the charge as inspiration is her great-aunt Ginny Grankowski, who lived through five husbands but is being challenged by a Social Worker threatening to take away Aunt Ginny’s home. Anyone, who has ever had a high school reunion or simply returned to their childhood home, will relate to suddenly regressing back to that horrific state of being insecure and immature. Instead of being a rather dour novel of a depressed woman struggling to find happiness, even at her lowest Poppy never loses the acerbic quick wit that makes her so entertaining. Sure, she might prefer the Rapture to an evening with her mother-in-law, but Poppy also has the memories of the husband whom she grew to truly love. Much of the novel is an absolutely delightful exploration of Poppy’s growth, from the woman who sacrificed so much after one drunken mistake to one who finally decided to stand up for herself. Part of that is also learning to take care of herself, leading to the adoption of a healthy, Paleo diet. Health, not thinness, is the priority, and as Poppy grows stronger she also becomes more confident. It perhaps explains why two unexpectedly attractive opportunities arrive in Poppy’s life, as before she may not have been ready to allow this into her life. This debut novel is inspiring, outstandingly funny, and moves along at such a fast pace that the charming ending arrives far too soon. It will be a delight to see how the author and Poppy manage to outdo themselves now that the bar is set so high. To enter to win a copy of Class Reunions are Murder, simply email KRL at krlcontests@gmail[dot]com by replacing the [dot] with a period, and with the subject line “reunions,” or comment on this article. A winner will be chosen February 24, 2018. U.S. residents only. If entering via email please include your mailing address, and if via comment please include your email address. This is going on my TBR pile. Thanks for this chance! Just read chapter 1 on Amazon and this book sounds awesome! brichardson0056(at)yahoo(dot)com. I’ve always enjoyed murder mysteries where high school reunions are a part of the story line. Can’t wait to read. Thank you for the information and review on “Class Reunions are Murder” By Libby Klein! Love the cover of this book. Absolutely love to read cozy mysteries and would love the chance to read this one. Thanks for the review and thanks for the chance to win a copy. Wow from the Queen of class reunions and seeing old classmates who were so hoity-tout your become one of the gang, this sounds like the perfect book! Would love to read and review it! 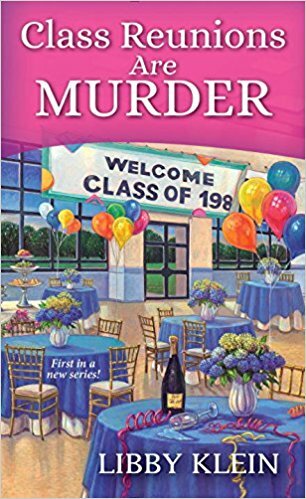 Thanks for the chance to win a copy of Class Reunions are Murder. I really enjoyed the description of the book. Sounds like a great read..
will be coming up in May (I guess – don’t know how many or if any are left – besides me). Sounds like a fun read. new to me author. thanks for the write up. This sounds good! I have not had the compulsion to travel back home for a reunion, much less with the mean girls of the 70’s, but this sounds really good. Thanks for the chance to win!